I love flags and stars on the 4th of July! There is something so pretty about our flag. I love pulling up to our house and seeing the flag flying out front. This project combines a star with our flag. That's perfect for me! 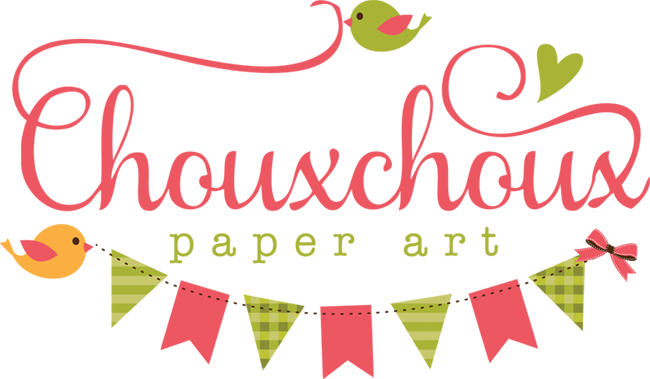 I printed the stripe paper on 110lb paper double sided. I'll tell you why a bit later. 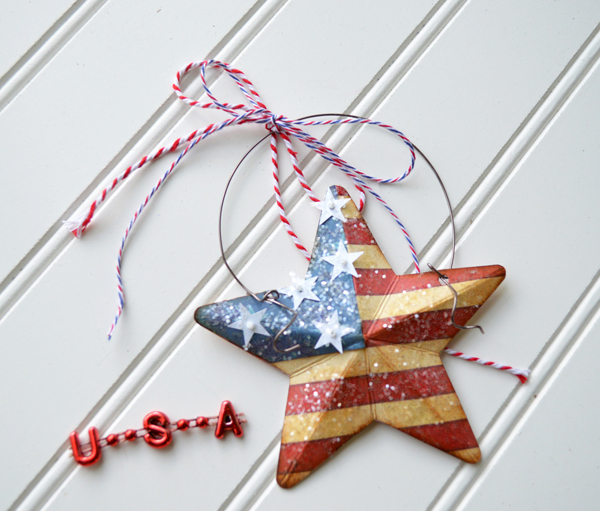 To do the star - the way I made it - you will need two striped stars. One will be the back. You want the stripes to go horizontal across the star. Also, I think fat stars make the best 3D stars. Not really skinny points. You can use a die or draw them yourself. My star file is from Silhouette. First you will need to score your stars. I marked my score board with a silver sharpie so it would be easy to line up a point with its corresponding intersection. Score all five points. On the blue star, only score the points marked with an asterisk. Then cut the blue star on the score lines. When you cut the blue star, it will be slightly off. You just need to trim it so that you get a nice edge that lines up with a stripe. Each star may be slightly different depending on how the stripes fall. 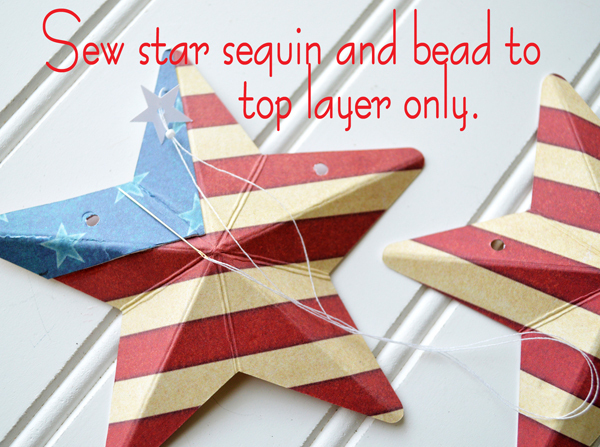 Glue blue piece on top of red striped star. You may want to score again the lines that run across the blue paper. 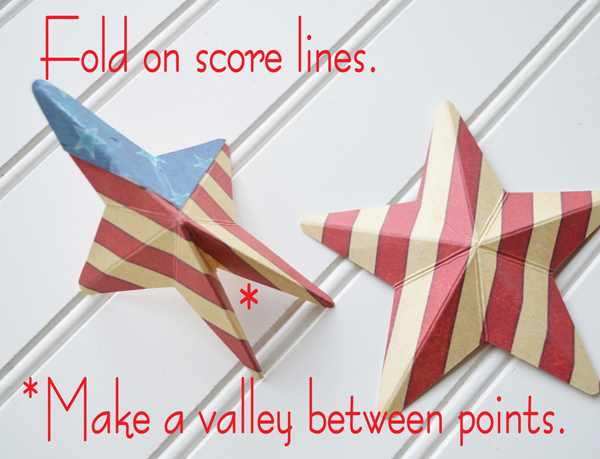 Now you are ready for the 3D effect: fold on all score lines. Isn't that cool? 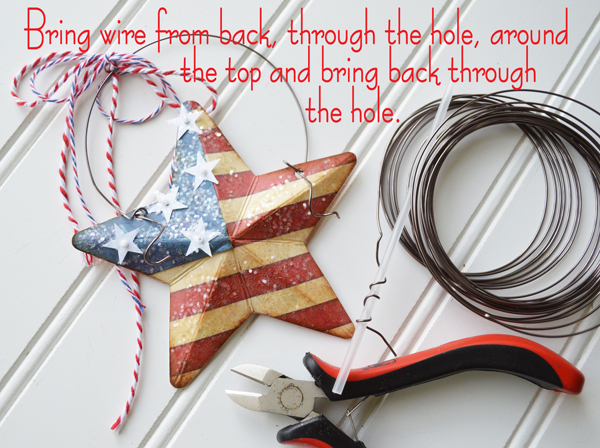 Punch the holes far enough from the edge, that you don't have to worry about pulling through them with the wire hanger. Then take the back out and set aside. You could probably glue the sequins on, but with those tiny tiny seed beads, I thought the only way to go was to sew them on. So that's why you need a back - to cover the thread knots. Also, it makes the star nice and thick. I printed the star paper on both sides so that when I slip the back into the front there isn't any white showing. 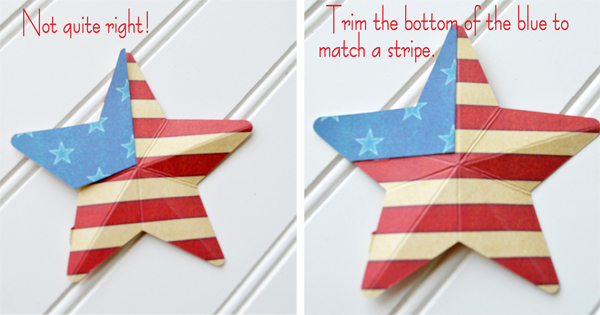 It is really hard to get the two stars folded exactly the same, so it really helps to have the stripes on the other side as well! Once you've finished sewing on the sequins and beeds, you are ready to add the hanger. The wire I used is 20 gauge. I added a bit of distress ink on the edges and scores. And glitter, of course! 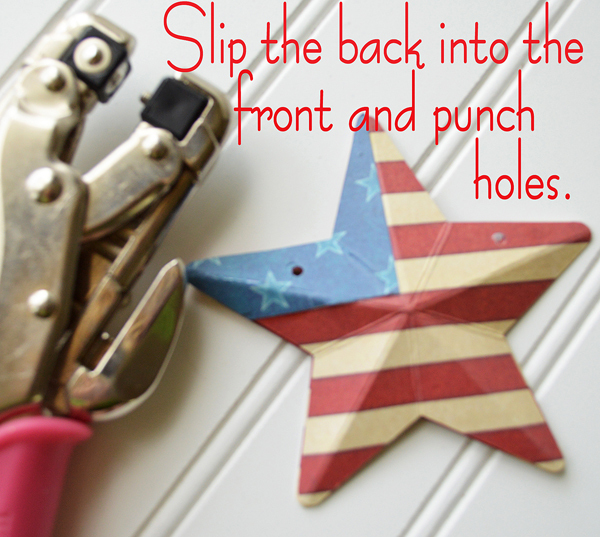 These make wonderful 4th of July decorations or you could clip them to a sack of sparklers or a treat. Do you have a 4th of July tradition? I'd love to hear about it. I DID think it was glued onto tin or something! 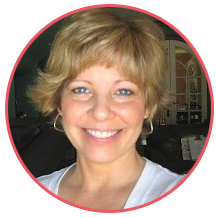 Lovely project Lori. 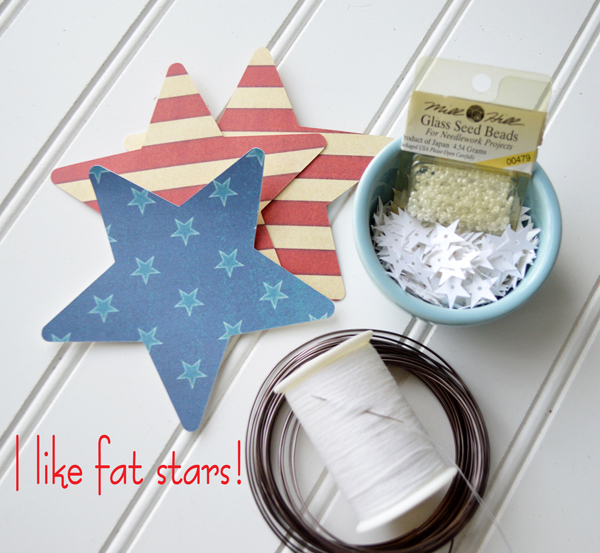 Looks like you will have plenty of decorations ready for your 4th July celebrations. Fabulous and really do love how it looks like tin! TFS and have a great weekend. What a fun and fabulous idea! Love it! What a fabulous star Lori, you've actually made it look like a metal piece! Supercool! I have been looking at these stars for days! I'm sorry I didn't have the time to leave a comment earlier but I am OVER the MOON about these stars. I know they would have a beautiful home on my tree...LOL! These are freaking awesome and make me smile from ear to ear. LOVE them!! Thankyou for the tutorial..........love your gorgeous stars, they so look like metal!